Shooter highlights the precision and calculations needs to be one of the great snipers in the world. Unfortunately, the drama is lack luster and doesn’t really offer up the level of suspense and tension that it should. In March of 1993, Stephen Hunter (Black Light) wrote a novel called Point of Impact. Fourteen years later the novel was made into the movie Shooter starring Mark Wahlberg (Deepwater Horizon). Ten years after that USA network has brought a new adaptation with the same name to television. Season one of Shooter had ten episodes last year and season two has just begun bringing the world of the military and rifles to the forefront of our imaginations. If you missed the first season you can catch up now as it is on sale on DVD. Bobby Lee Swagger (Ryan Phillippe; Cruel Intentions) is a former Marine who was a sniper in the Middle East. He now lives a quiet life in the woods of Washington State with his wife, Julie (Shantel Van Santen; One Tree Hill) and daughter, Mary (Lexi Kolker; Female Fight Squad). He is happy with civilian life until his former squad leader, Isaac Johnson (Omar Epps; House) – now a Secret Service agent – comes asking for his help. Johnson asks Swagger to help him anticipate how a professional sniper who threatened the President will attempt to assassinate him at a speech in Seattle. When Swagger fails to stop the murder he finds himself suddenly the leading suspect as he comes to the realization that he has obviously been set up. That is episode one and the rest of the season is spent trying to figure out the players in the plot, the motive and spending his time trying to clear his name. Along the way, his wife and child end up in danger and he receives help from an unlikely ally – an FBI agent named Nadine Memphis (Cynthia Addai- Robinson; Arrow) – who believes he is innocent. The season ends with Swagger clearing his name but only after he sees things he shouldn't and he infiltrates the Russian Embassy in Seattle. Phillippe is well suited to this role but, while I couldn't quite put my hand on it, I felt there was something missing. He does play his part well especially when he goes into "sniper mode" and a certain sense of calm comes across his face. Van Santen works as his wife and Kolker is well suited to playing the child of a military man. Epps does a nice job and there are notable supporting roles including Beverly D'Angelo (National Lampoon's Vacation) as NSA Head Gregson. This show has a specific audience in mind and the producers cater to those individuals. Former military, especially Marines and Snipers should take pride in the show as it casts them in a generally good light. It is also fascinating for rifle enthusiasts as well as giving an inside glimpse into the mind of a sniper. Shooter highlights the precision and calculations needs to be one of the great snipers in the world. Those moments were interesting to watch along with the drama that unfolded throughout the ten episodes. Unfortunately, the drama is lack luster and doesn't really offer up the level of suspense and tension that it should. 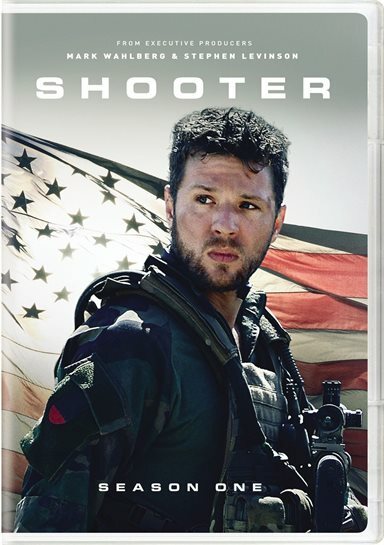 The DVD offers only one extra - an 8-minute look called the Making of Shooter that gives behind the scenes insight into what goes into creating such a show. There are cast and crew interviews that are interesting and knowledgeable. One would hope with an interesting premise and a solid cast the show would be a hit, which it moderately is for those who like the subject matter. However, while it does pick up some steam as the season progresses, it doesn't always hit the mark. If you like rifles and are interested in trajectory and wind speed, this is the perfect show for you. Download Shooter: The Complete First Season from the iTunes Store in Digial HD. For more information about Shooter visit the FlickDirect Movie Database.